I hosted my Bible study group last week. Each time we meet, we have it at someone's house and she cooks the meal that night. I made pizza and served it with salad, fruit, and vegetables. I also made a cookie cake, which is not pictured because I made the icing too runny, and it was a mess. I sauteed sliced mushrooms with some grated elephant garlic and fresh herbs. A woman at the farmers market talked me into the elephant garlic, and this was actually the smallest size she sold. She said that it is kind of like a mix between onions and garlic and it is in the leek family. I have sliced and grated it to go in a few things I sauteed; it smells like onions when raw and looks like garlic. I can't exactly pinpoint the flavor since I've mixed it with several other foods, but I would say it is milder than either onions or garlic when cooked. Again, I put my dad's friend's fresh herbs to work. I sauteed oregano with the mushrooms; it smelled amazing as soon as it hit the hot pan! 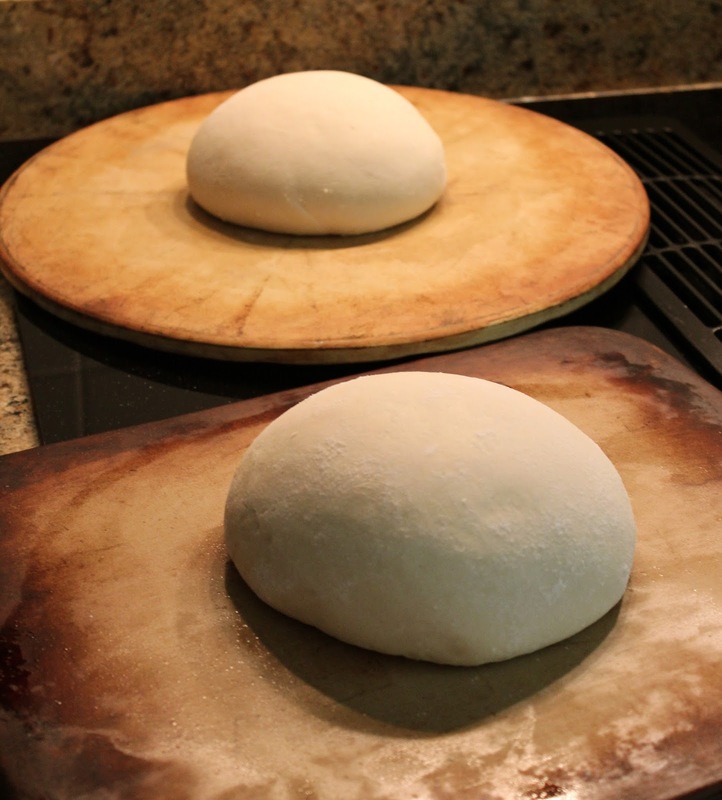 I have made pizza crust several ways, but my favorite is using pizza crust yeast and following the recipe on the packet. Well, this time I wandered away for about thirty minutes [distracted by blogs I'm sure] and came back to find the dough had risen quite a bit. I then rolled it out and topped it and put it in the refrigerator for a few hours before it was time to bake it. It was the best crust I have made yet--a little crispy on the outside with a yeasty flavor. I chopped some more oregano along with basil to top the more adventurous of the two pizzas. The finished products: something for everyone. We have different palates in our group, so I made a little part of each pizza with a different combination of cheese and toppings. What's your favorite meal to cook when you're hosting friends?